The CARGO forms a vibration free unit with bags from all well-known manufacturers without exception. Its variable attachment system makes an easy installation on nearly all frame geometry combinations. The middle strut makes a loop from one dropout to the other adding greatly to the structural strength. Viewed from the rear it makes a triangle with the hub which makes the rack extremely stiff. There is an integral light bracket on the rear that accepts not only most American style battery rear lights, but also European style generator lights, such as the Busch & Muller Dtoplight Plus. Note: Having weighed a sample rack from our stock we found that this rack weighs 695g incl fittings. I would like something like the Tubus Cargo but maybe lighter. What fittings do I need for the drop outs and can I buy these separately please. I very recently bought the Mercury second hand. 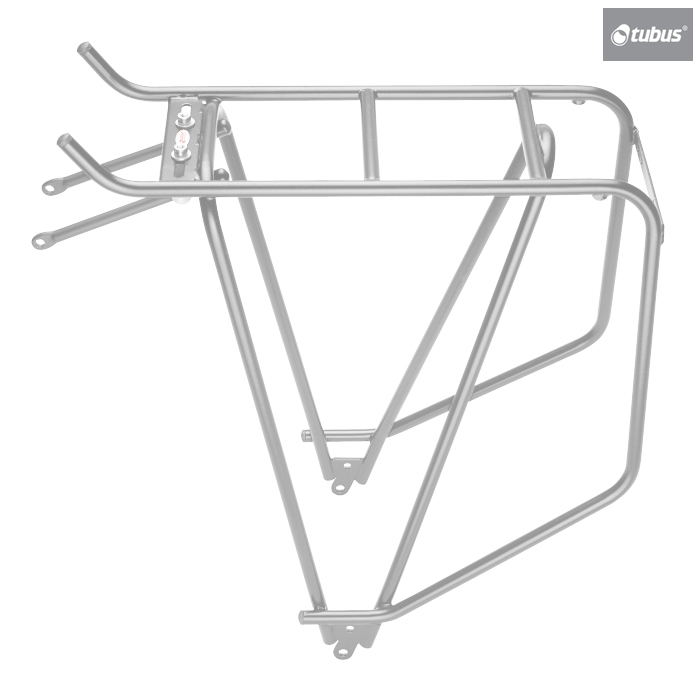 There aren't many rear racks that are lighter than the Tubus Cargo other than Tubus' Titanium models which don't offer as much rack space. Your Mercury will take M5 bolts to fit the rack, these are available separately, but the length and any washer/spacers needed will vary on what rack you end up fitting.